This little hotel is located in the heart of Paris – within walking distance of all the action…Opéra, the Louvre and the Tuileries gardens…and yet, it is calmly tucked away on the rue de Valois. It would almost go unnoticed, and yet everything about it is so well-known; interior design by Pierre-Yves Rochon (himself! ), sculptures of workshops from the Louvre, fabrics from Pierre Frey and Manuel Canovas, made-to-measure furniture…all is in excellent taste and the bedrooms boast a perfectly Parisian charm. 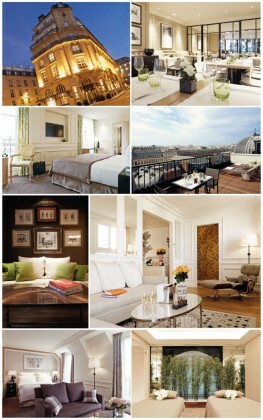 And for a lucky few, a panoramic view makes these rooms worthy of an even more prestigious mention. It’s all just too much: The Carita spa, an intimate, pocket-sized space with a duo cabin and signature treatment that lasts 90 minutes, alternating between hot-stone massages, stretching and reflexology. Also open to non-guests!